The season started with fights aplenty, and with the playoffs out of reach, it will likely end with numerous fights as well. With the playoff streak ending, there is much less to fight for, aside from actual scraps. Friday night was the next chapter in the Red Wings-Lightning rivalry that has developed in recent years. Despite the absence of agitator Brian Boyle (now a Maple Leaf), there were two fights, and both from surprising participants. In an otherwise uneventful first period, Detroit’s Andreas Athanasiou and Tampa’s Adam Erne squared off in a competitive bout. Justin Abdelkader cross-checked forward Joel Vermin, which began the action. 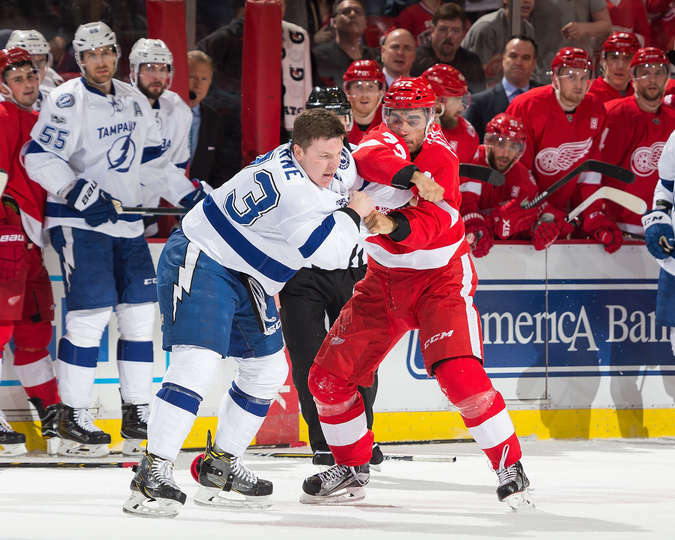 Erne pulled Athanasiou away from the fray and the two exchanged punches. Early in the second period, the mayhem continued as Anthony Mantha stepped in to defend teammate Dylan Larkin after he was boarded by Greg McKegg. After Mantha easily won the fight, he added two fully-charged punches as McKegg was already on the ice. He was given a two-minute instigator penalty and a ten-minute misconduct in addition to the five-minute fighting major. Despite being outshot for most of the game’s first half, captain Henrik Zetterberg scored the game’s first goal. He one-timed a pass from Gustav Nyquist that may have deflected off a Lightning defenseman before it found its way past goalie Andrei Vasilevskiy. Tampa tied it early in the third, as Ondrej Palat potted an easy rebound past Petr Mrazek. Nikita Kucherov had the initial shot. In the overtime period that followed, Brayden Point set up Kucherov with a great play for the game-winner as the latter went to the net and deftly deflected a shot over a stretching Mrazek. Detroit dropped to 5-12 in 3-on-3 overtime, the worst record in the league in the extra period. The team also went 0-for-5 on the power play, despite 10 shots. Detroit will play three games in three nights beginning Sunday.